DuPont™ Tychem® 2000 C Sleeve model PS32LA. 50 cm long and with wide elastics at cuffs and upper arm. Available in yellow and in one size. 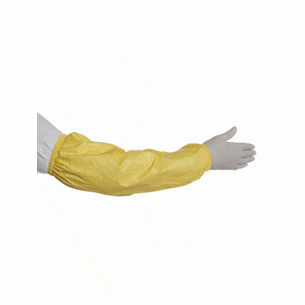 Specially designed for use with Tychem® apparel, Tychem® Accessories can help offer enhanced protection for body parts that are more exposed to hazardous substances. Tychem® 2000 C garments and accessories utilise the strength of Tyvek® and a polymeric barrier coating to offer good permeation barrier protection against a wide range of inorganic chemicals and biological hazards (even under pressure).